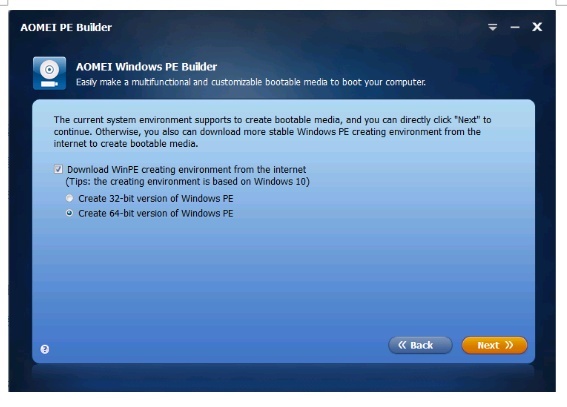 With the freeware AOMEI PE Builder, you can make a bootable environment based on Windows PE without installing AIK/WAIK. You can DIY your WinPE because it provides many useful tools and it is much more easier to get started. When your Windows system is corrupted or cannot be boot normally, try this program to boot up your computer please. This software will help you recover quickly and do maintenance simply. The interface of AOMEI PE Builder is user-friendly. Deep blue screen, very cool! There are few options and buttons on each window, every step has guides. Recuva: A supremely file recovery tool. SumatraPDF: A free PDF reader for Windows but also supports eBook, XPS, DjVu, CHM, etc file system. Everything: A small and fast search engine that locates files and folders by filename for Windows. 7-Zip: A file manager with a high compression ratio. IrfanView: It is a very fast, compact and innovative FREEWARE picture viewer/converter. Notepad++: It’s an editor and Notepad replacement that supports several languages(html, xml…). Q-Dir: Quad Explorer, which makes your files and folder easy to manage. PENetwork: A small utility to install and manage different network settings in Windows PE. Filezilla: A fast and reliable cross-platform FTP/FTPS/SFTP client with lots of useful features. 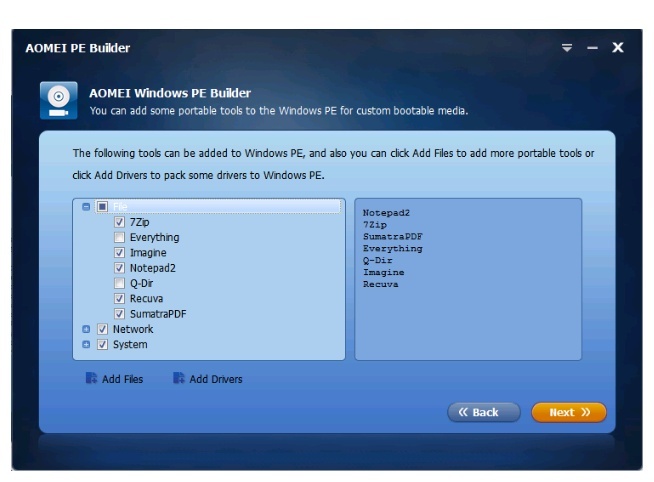 As the above image shows, AOMEI PE Builder supports adding some portable tools into Windows PE for custom bootable media. This feature greatly increase the flexibility of AOMEI PE Builder. It also supports adding drivers to Windows PE bootable media so that Win PE can recognize more hardware. After you decided files and drivers, click the yellow Next button to go next page. You see, the Windows PE bootable media can be a CD/DVD disc, USB flash drive, or an ISO image file, you can choose either one of them according to your preference. 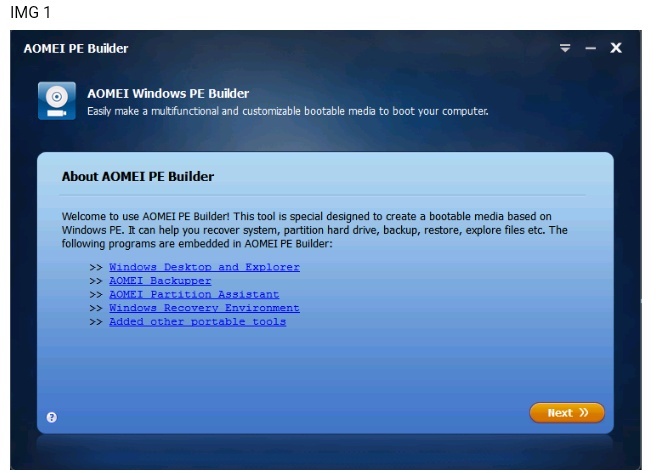 Notice that although AOMEI PE Builder can be run on all editions of Windows 7, 8/8.1, both 32-bit and 64-bit, Windows Server 2008(R2), Windows Server 2012(R2), Windows 2011 SBS and WHS. If you run AOMEI PE Builder on a 64-bit operating system, then the bootable Windows PE media that you created supports both UEFI/GPT boot mode and Legacy BIOS/MBR boot mode. 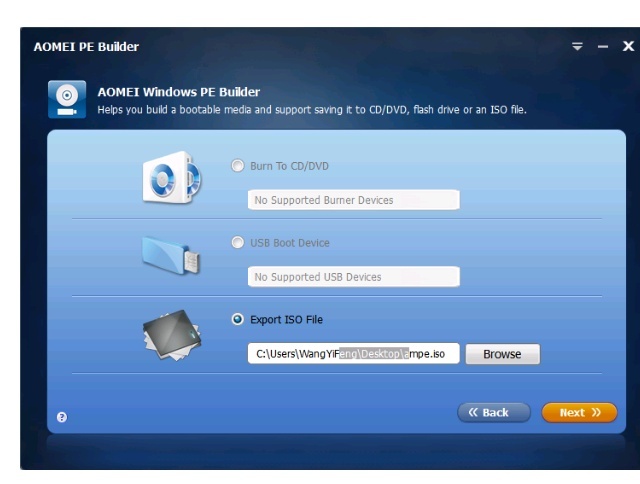 If you run AOMEI PE Builder on a 32-bit operating system which cannot support UEFI/GPT boot, therefore, the bootable Windows PE media that you created only supports Legacy BIOS/MBR boot mode. Unluckily, AOMEI PE Builder did not support Windows XP/2003/Vista. For users who are with these operating systems, they can create Windows PE in systems supported by PE Builder and use the Windows PE in their own systems. When the creation is over, you can restart your computer and adjust boot order to USB device(here we take this as an examole) to enter Windows PE system (usually, you can enter BOIS system to adjust boot order. 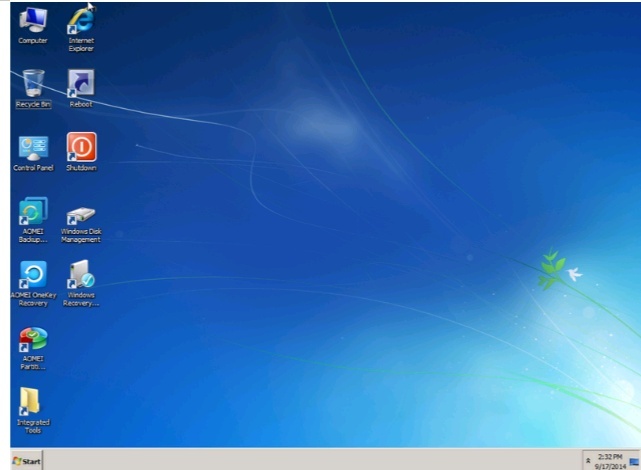 For detail operations, you can refer to the instruction of your computer or your motherboard). The following picture is what you can see when enter Windows PE. AOMEI PE Builder was released four years ago. At the end of last year, it has been updated to 2.0 version. Some impossibles become possible now, for example, it fully supports Windows 10/Vista/XP nowadays. It added dual-boot function too: a Windows PE bootable media supports both EFI and Legacy BIOS boot modes. And supports to cancel the operation during the process of creating a Windows PE bootable media. In 2.0 version of AOMEI PE Builder, its second step changed a lot, please see from following screenshot. If your current Windows system is Windows 7, or other non-Windows 10 operating systems, you don’t have to check the item “Download WinPE creating environment from the Internet”. However, if your working system is Windows 10, you mush check the item and then select 32-bit or 64-bit Windows PE image to continue. 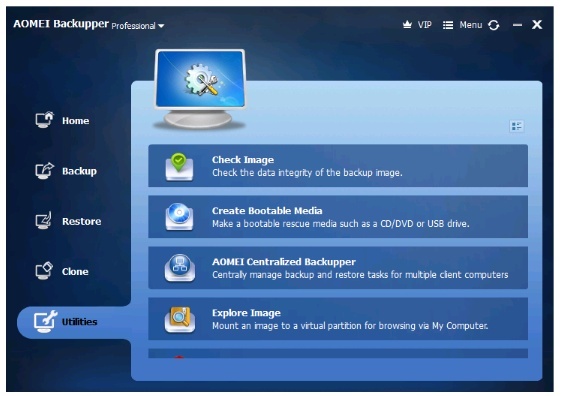 In fact, the backup software AOMEI Backupper’s integrated utilities has a small program similar to AOMEI PE Builder too, which is named Create Bootable Media. We think people can use these two AOMEI products to work together. In AOMEI Partition Assistant, the similar tool is called Make Bootable Media listed in Wizards. That is to say, AOMEI family has Win PE technology so that they have Win PE products. If you highly pay attention to computer security, you can own all of them on your computer, they will protect your data and optimize system all around the corner. ← What Is So Fascinating About Scientific Discoveries?